Nepal\'s highways wear a clean and smooth look in most places. If you've ever wanted to hop on your bike and rise around your own country, this is the time to do it. Because of this year's deficient monsoon, there are very few landslides blocking Nepal's highways. The ceasefire means there is no harassment at army checkpoints and no danger of being caught in a highway firefight. But the real reason is that Nepal's highways have never been better. Thanks to proper planning and maintenance under a Department of Roads (DOR) program, it is actually fun to drive in Nepal these days. 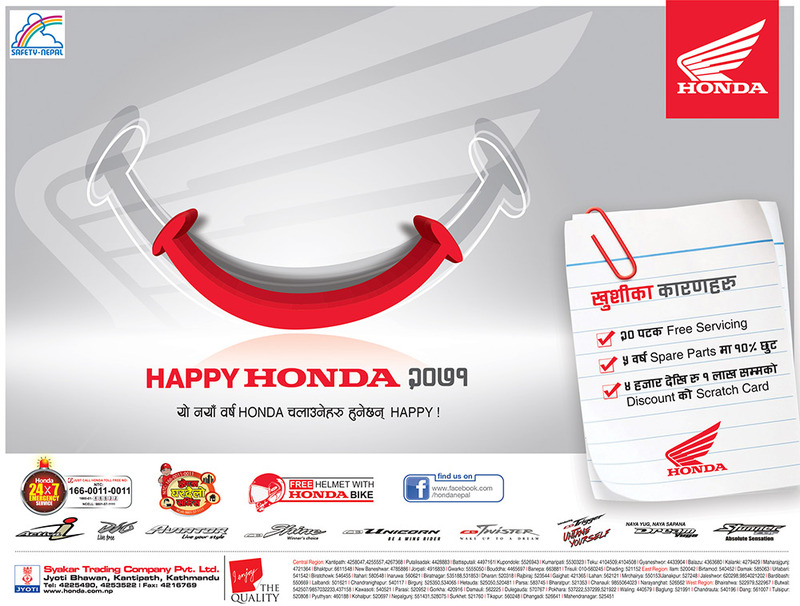 That was the impression we got during a recent trip across the Prithbi Highway to Pokhara, down the Siddharth Highway to Butwal and then looping back across Butwal and Narayanghat to Mugling and then Kathmandu. There are no more daily headlines about the Narayangat-Mugling stretch still being closed, or the landslide at Krishna Bhir blocking Kathmandu's main artery. As far as our highways go, no news is good news. People take roads for granted and underestimate the care they need. The worst enemy of the asphalt pavement is water-without proper drainage a road is destroyed within a few months of being paved. Many don't realise this and blame corrupt contractors. While contractors may cut corners, the reason could also be farmers diverting drainage to their fields, roadside settlements blocking drains and potholes being allowed to grow. SWEEPER HIGHWAY: Female lengthworker Debi Maya Gurung (right) on her way home after a day maintaining a stretch of highwayin Syangja recently. Part of the reason for the relatively good shape of Nepal's roads is the Swiss-funded Strengthened Maintenance Division Program (SMDP), which has just wound down after 13 years. One of the enduring legacies of the SMDP is a nationwide system of daily road maintenance by local communities. As with everything else in Nepal, the best solution is the local solution. "The Swiss perfected the system after building the Lamosangu-Jiri Highway and let villagers along the highway maintain a length of the road. They came to be known as 'lengthworkers' and the program was scaled up nationwide," says Devendra Dhar Pradhanang, maintenance management adviser at SMDP. You see them everywhere today, with their faded orange flags, orange helmets and orange jackets. Usually elderly villagers, they painstakingly clear drains, fill potholes, or ensure that the road shoulders are clear of vegetation. Some even sweep the highways, because pebbles and stones can increase wear and tear. The lengthworker is vital to reliable road maintenance in Nepal and the idea has been replicated in Kenya and other Asian countries. The project has now been handed over to the DOR, and the big question is whether it will run as efficiently without Swiss management. The department employs 1,600 lengthworkers all over the country for routine maintenance. Local villagers can earn up to Rs 150 a day for maintaining a 3km length of road each. Besides keeping roads in good shape for less money, the system also contributes to poverty reduction among the rural population along the highways. There are still scars of fighting, like (right) at the strategic Surai Naka Bridge in Kapilbastu. The bridge was bombed by the Maoists in 2001 and although hundreds of buses and trucks risk crossing it everyday it still hasn't been repaired. 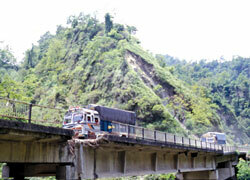 If this bridge collapses the Mahendra Highway between Butwal and Kohalpur will be cut. Experience shows that as long as lengthworkers do their jobs properly, roads last longer and need less frequent and expensive repairs. Of course, for emergency and bigger maintenance work the department has rapid reaction teams. "This is a really effective way to reduce pavement deterioration," says Narayan Puri, engineer with the Road Division in Butwal, "and the added advantage is that when local sections of the road are maintained by local people, there is a feeling of ownership and pride. 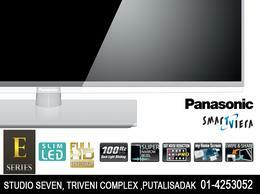 And it provides employment to villagers." Lengthworkers are now respected, though when they started ten years ago villagers used to make fun of them. More and more lengthworkers are also women. A group of women lengthworkers had just finished the day's work near Waling on the Siddhartha Highway recently and were trundling their wheelbarrows home when we ran into them. "We thought all roads were the same," said their supervisor, Debi Maya Gurung,"but now I can tell just by looking at the grass on the shoulder or the state of the drain whether the lengthworker is doing her job properly." The SMDP is competing directly with a new performance-based maintenance contract system being pushed by the World Bank and the ADB. The two approaches couldn't be more different. One relies on community participation in road maintenance, and the other on big contractors awarded huge sums to maintain sections of the road. A performance-based system may work in western countries, but Nepal's roads pass through villages and farms and are used by livestock, children playing on the pavement, and peasants who dry wheat and corn on the asphalt. Experts say the performance-based contract system would encourage corruption, lead to road deterioration and remove the lengthworker system, which enhances the livelihood of the local communities. 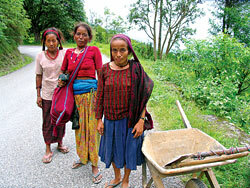 Nepal's roads need communities involved in their upkeep. The lengthworker system is a proven, cost-effective success story. 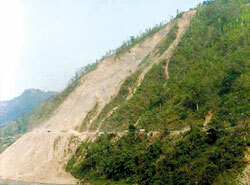 SLIPPERY SLOPE: Krishna Bhir in 2000 (above) when it was blocked for nearly two weeks after a mountain collapse, and in 2006 (below) after the bio-engineered slope stabilisation. 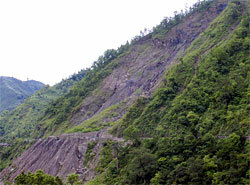 The infamous Krishna Bhir landslide is no longer in the news everyday for blocking the Prithbi Highway. Why? Because now, the road works. 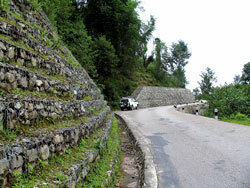 A cost-effective, home-grown system of slope stabilisation using vegetation perfected by Nepali road experts is in use at Krishna Bhir and other major landslides in Nepal. Bio-engineering has nothing to do with genetic manipulation; it just means planting the right bushes and trees to stop slopes from sliding. An entire side of a mountain slithered down to the Trisuli River during the 2000 monsoon blocking the main highway for 11 days. Even after the debris was cleared, the road would be blocked following relatively light rain. A Japanese contractor studied the problem and proposed to fix Krishna Bhir for over Rs 2 billion. The successful plan finally used was Nepali-made, and cost under Rs 40 million. "We studied the landslide carefully and found the weak points," recalls Naresh Man Shakya, the engineer in charge of the project. "We decided on a combination of water and debris management, and bioengineering." Shakya uses special grass to trap debris, armour the surface and anchor the topsoil, thus stopping the slope slide. "Bio-engineering improves the environment and increases stability due to the plants' root system," explains Shanker Rai, an expert in the field at the Swiss-funded District Road Support Program (DRSP). Shakya's work at Krishna Bhir is internationally recognised and he is often called to share his experiences in Bhutan, Japan, Britan, and Norway. "We succeeded," he sums up, "because we pinpointed the problem, then designed a solution according to technology and local resources available." With the ceasefire, Nepal's Rural Access Program (RAP) is being restarted with support from the British aid ministry, DFID. Its new model of road-building and maintenance provides roads and alleviates poverty. The $44 million program which aimed to link roadless districts to the highway network, was started in 2001 but stopped because of the insurgency. After debating whether to terminate it, DFID has decided to go ahead with a scaled-down version. The project will be handled by new management and plans to refocus work on four eastern districts (Bhojpur, Khotang, Sankhuwasabha and Terhatum), terminating work in Dailekh, Accham, and Doti where only 10 percent of the project could be finished because of the conflict. "With new management and the new political situation, we hope roads will help in poverty alleviation, by providing livelihood opportunities through employment in construction," says Roger Weatherell, the newly appointed program manager at RAP/DFID, adding, "it's better to concentrate on fewer areas with better output than to take a bigger area with no output." Durga KC, director general at the Department of Roads, says he is glad RAP hasn't stopped completely. "We feel sorry that people in the west couldn't benefit as planned, but we are relieved to have at least the eastern cluster." RAP is planning to do with local Road Building Groups (RBGs) what forest user groups did for community forests. The idea is to promote decision-making and maximise benefits in local communities-for example, by providing new livelihood opportunities through local enterprise. Already, 13,500 local people of the eastern hills have benefited directly from road construction. They are paid for work, and incomes are then enhanced through saving and credit schemes. This ensures sustained improvements to livelihoods even after the construction phase is finished. Says Indu Prasad Dhakal, coordinator of the Hile-Bhojpur Feeder Road Project of RAP: "These are the kinds of new roads we need all over Nepal, focusing not just on technical aspects but social ones too."